Today a young woman with a most curious tattoo came to the junk shop. 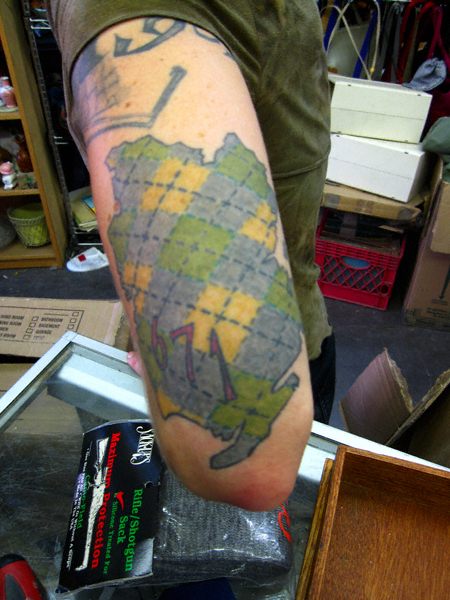 As you can see it is the borough of Brooklyn, rendered in argyle, and includes a number. Anyone care to guess what it means? She told me and I will give the reveal tomorrow at noon. Itâ€™s really neat! Well, it’s noon and here’s the reveal. This very nice young lady (who is employed at Papasitos) came into the junk shop with her mother— who was a lovely lady in her own right. She was fabulous. As they were exiting I got a passing glance of the above tattoo. I locked onto the visage of Greenpoint like the Garden Spot geek that I am. I can pick out the silhouette of our fair burgh a mile away. Probably because it bears a disquieting resemblance that fucked-up blob thing from the Gigglesnort Hotel I saw— repeatedly and much to my disturbance— as a little kid. I looked again at her tattoo. This time to the south. I recognized Coney Island. My eyes were not deceiving me: this was county of Kings rendered in Argyle. With a number: 671. So I asked her about it. I thought I grew up in the suburbs— until I actually saw what suburbs were. So there’s the reveal. A tattoo— which in hindsight— is not so cryptic. And pretty damned cool! Hey, if her mother (who has since left Victorian Flatbush) likes it, who am I to judge? What’s more, I think it is neat!